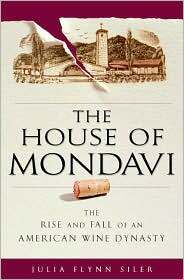 The House of Mondavi is a captivating account of the rise and fall of the preeminent wine making family of California; the Mondavis. Based on 525 hours of interviews with more than 250 people and the examination of tens of thousands of legal and corporate documents this wine book is a fair and objective account of a family history and its impact on the American wine industry that reads more like a fictional novel than a work of non-fiction. This is the Mondavi history in all its goodness and human foibles. The book begins with the immigration of Cesare Mondavi from a small village in Italy to the mining towns of Minnesota and then follows the family as they make for California to start a grape shipping business and bare the sons that would make them famous; Robert & Peter Mondavi. As in most family businesses the questions of succession when the patriarch dies is frought with danger; the sad thing is that this family feels this burn twice; once when Cesare dies and then again when Robert dies and leaves his dynasty in the hands of his two sons; Michael and Timothy. The tale is familiar enough; the Mondavi family loses the entire business in a board room coup and is forced out forever. A riveting wine book for anyone interested in the American wine industry or in the life of a man with an oversized personality and oversized problems.